Play dough. 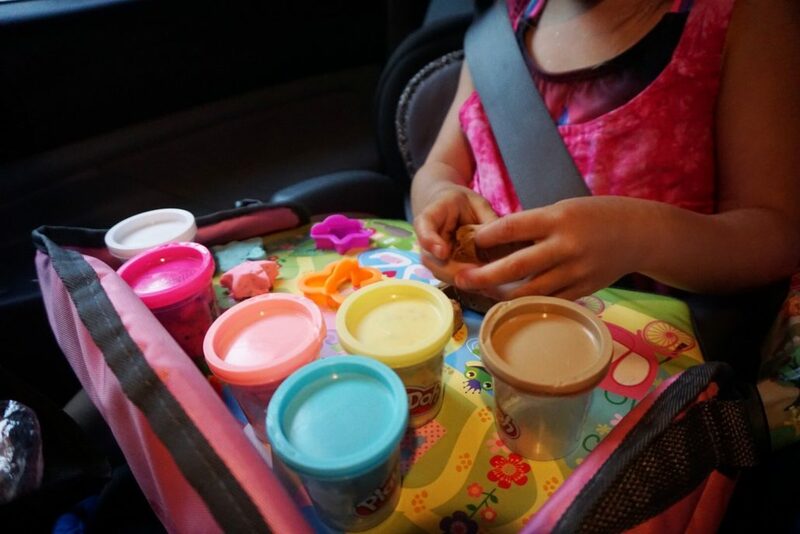 I keep a stock of play dough in her back seat organizer along with play dough mats that I printed from here and laminated at home. I also have a tackle box full of supplies that she uses to decorate her play dough creations. Keep it classic; always have a couple of coloring books with crayons, markers or colored pencils. Whatever your kiddo prefers. Brain Quests, found here, are a great way to pass the time and give the brain a good workout! Educational work books and printouts. You can find plenty of options to purchase these, or if you are on a budget you can find thousands of printable worksheets here to create your own work book. I laminate them and purchase whiteboard markers so we don’t waste paper, and they can be used an endless amount of times. Pipe cleaners are cheap and really entertaining! We practice making shapes, letters and silly things. Pipe cleaners get your kid’s imaginations rolling. DVDS. Road trips are the exception in our family for allowing a lot of screen time. Especially now that we are traveling full time, and there’s a lot of drive time. Just make sure to turn the movies OFF when driving through somewhere extra scenic. You’ll want their eyes exploring out the windows, and not on the screen. Talk! Talk about the trees, the mountains, the rivers . . . take in your surroundings as you drive, and engage with your kids! Drop fun facts on them about the areas you are driving through. Ask them questions about the things they see out the windows. Engage, communicate . . It’s amazing to get inside their heads and hear what they have to say.